Quite simply autumn in a dish. Sweet tasty and utterly delicious. 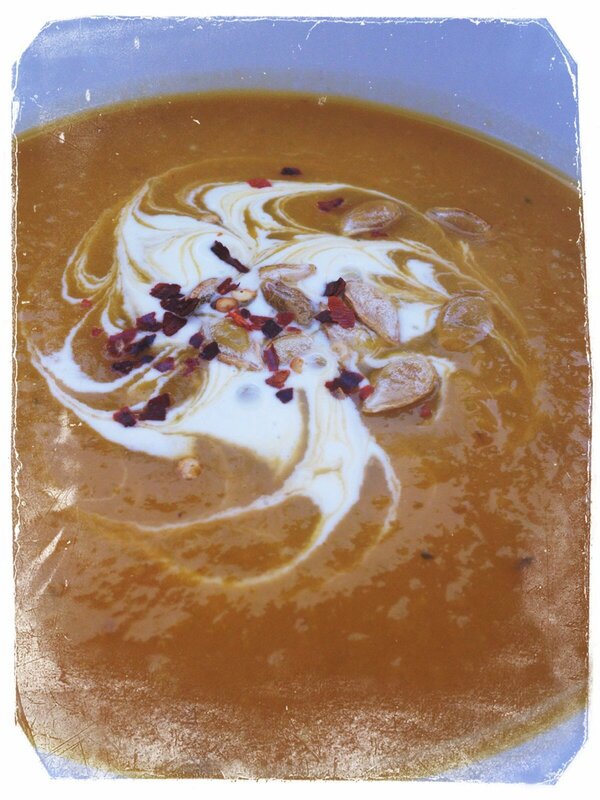 Roasted butternut squash makes a lovely thick rich soup perfect for warming you up on a nippy day. Butternut squash soup is very simple to make. Just chop up your squash into chunks or slices – remove the seeds but don’t bother to peel, the peel will cook down nicely into the soup. I roast the butternut squash tossed in a little olive oil and sprinkled with chilli flakes as I like things hot. Whilst the butternut squash is roasting just whip up a simple soup base. Sauté a chopped onion, celery, carrots and leek, pour over vegetable stock and simmer whilst you wait for the squash to roast. Once the squash is nicely browning just scrape the whole lot into the soup pan and cook for around 15 minutes. Then blend everything together with a hand held blender. I like to add a swirl of creme fraiche and an extra sprinkling of chilli flakes just before serving. Butternut squash soup is simply delicious served with a nice flavoured bread – I like beetroot (you can buy scrumptious beetroot and apple bread at the Coop). The soup tastes so good for autumn picnics – well worth popping into a thermos and taking with you. Delicious warming soup with a kick for autumn. Place the butternut squash into a roasting tray, drizzle with oil and chilli flakes and toss with your hands to coat everything. Roast the butternut squash for around 30 minutes until browning and tender. Whilst the squash roasts make up the soup base. Add a splash of olive oil to a large saucepan and add the onion, garlic, celery, carrots and leek to the pan and sauté for around 10 minutes. Pour over the hot stock and bring to the boil - then pop the lid on and reduce to a simmer. Once the butternut squash is cooked tip it into the soup pan, season with salt & pepper and cook for around 15 minutes. Blend the soup together. If it's too thick add a splash more vegetable stock to loosen. To serve just ladle into dishes and add a swirl of creme fraiche. Don't forget to save the squash seeds and make them into spiced seeds! If you saved your seeds – then follow me over to a lovely spiced & salted seed snack.